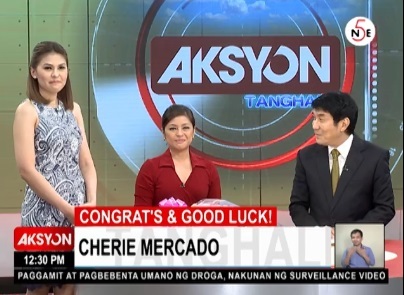 TV5 anchor Cherie Mercado has left her perch at Aksyon Sa Tanghali to become the new spokesperson for the Department of Transportation and Communication. Making her final appearance on the TV5 midday newscast Friday, Mercado was given a send-off by her co-anchor Raffy Tulfo, and the program's staff and crew. In her Facebook account, she posted: "When I felt something was coming in the newscast I vowed not to cry. But the whole staff started entering the studio and piled up behind the cameramen, some teary eyed, paano ka naman hindi maiiyak." "Thank you to my Aksyon Sa Tanghali family! You've been nothing short of awesome!" she wrote. "Continue to strive for excellence in what you do. Remember your influence as media people. Never take it lightly. Be kind to me when I'm on the other side of the fence k?" Mercado joined TV5 in 2004 as anchor of Big News. She would later on headline some of the network's news programs including Aksyon JournalisMo, Pilipinas News and CNN Konek on AksyonTV. Before that, Mercado spent almost a decade with ABS-CBN News as anchor of Global News and as host of Alas Singko Y Medya and ANC's Coffee Talk with Cherie Mercado. Mercado is not the first Kapatid anchor to be recruited by the Duterte administration. In June, her former co-anchor at the now-defunct TEN: The Evening News, Martin Andanar, joined the cabinet as the head of the Presidential Communications Operations Office.